His name was Reuben and his voice shook more than his hands did. My best friend had called earlier that night and asked if she could bring her new friend over to meet me. He wasn't what I expected. I had never met a person with Cerebral Palsy before. My interactions with disabled people were limited to so walking past the special needs class and staring at the kids like they were animals on display at the zoo. That girl who had spina bifida and a pimped out motorized wheelchair? I never even attempted to get to know her. Disabled people made me very uncomfortable. I was a healthy, ignorant teenager who suddenly had a visibly disabled kid standing in her living room, cracking jokes. Reuben wasn't at my house for very long but in that period of time I learned a very valuable lesson. One that had eluded me over the years. Disabled people are people too. It was a lesson I've carried with me ever since. Reuben's laugh and his shaky hands were branded into my memory. As it turned out, Reuben was a portent to my future, even if I didn't know it. When my husband and I decided to adopt a child we had to decide fairly early on in the process what type of child we wanted to adopt. We knew we wanted to adopt a child with disabilities but we had to examine what type of disabilities we thought we could handle. We sat down at a table in an old government office building, the carpet brown and faintly smelling of mildew and we stared at the pink piece of paper listing what seemed like every known disability a human being could have. We started checking off boxes. Yes to blindness, deafness and deformities. HIV, organ failure? No thanks. Developmental disabilities, yes please. The list went from a vague list of possibilities and narrowed to a specific set of diagnoses. ADHD? Downs? FAS? And then there was the box next to Cerebral Palsy. Every time my husband and I moved down the list, we would stop and discuss the possibilities as we best understood them and what bringing home a child with that health issue would mean to us and to our family. But when we got to the Cerebral Palsy box all I could think of was Reuben and his shaky laugh and red leather jacket. Cerebral Palsy, check. We checked so many boxes that when we handed in that form with our application the social worker looked at it and asked us if we we had made a mistake. Nope. We're just a bit insane, my husband joked. It was easy to check off most of the boxes. The chances of actually bringing home a child with most of those issues? Well, let's just say I have a better chance of becoming rich and famous. And then Jumby found us. Or rather, his social worker did. We were matched with his profile and all of his afflictions. Rather like online dating only less romantic and with more pharmaceuticals involved. I've written about Jumby and his health issues. His Cerebral Palsy, his blindness, deafness, his developmental delays. I've written about his incredible spark and the joy he brings to us, each day with every smile. But what I haven't written about a lot is what it means to parent a child like him. When he has more diagnoses than he does letters in his name. I've not gone on at any great length about how hard it can sometimes be, or how frustrating, because really, parenting any child regardless of health can be a head-banging frustrating job. So I'll whisper here, or sigh there, instead of stating plainly that sometimes getting the services my son needs is overwhelming and makes me wonder if I bit off more than I could chew. I don't write about how I have to go into the school at the start of the new year to meet the teacher assigned to my son and try to find the words to inspire them into wanting to include my son in their classroom. How this year I need to find out why the special needs coordinator for the entire elementary school happens to also be a grade three teacher and yet Jumbster was put into a grade three class with a new, inexperienced teacher. I don't write about how my son hasn't gained a single entire pound in over a year. How at almost nine years old he vacillates between 36 and 37 pounds and how we play the piano off his boney little ribs. I don't write about the fact his ligaments are so tight that every time I change his clothes I worry I am about to break his limbs and sometimes, it takes two people to pry his legs apart for a diaper change. And I certainly don't write about my fears for his future, if he even has one. How long will he live for and how will I survive burying another child? Where will he go, who will take care of him if something happens to me? Who is going to see past his many burdens to the awesome that resides within him? I don't write about those things even though each of them plays a large part in every single day I live with my son. I chose to use my voice to remind everyone that life is more than the hardships it's composed of. Jumby's life is bigger than his diagnoses. The joy my son has and brings others erodes the immovable overwhelming realities his life often entails. Living with Cerebral Palsy isn't a magical awesome thing. Its just life. A twisted, slower, tighter life than most, but then life's magic doesn't come from health. That magic comes from love, acceptance and understanding. All of which my son has in spades. And thanks to him, and even Reuben, so do I. Today is the very first World Cerebral Palsy day. There are 17 million people around the world with cerebral palsy. 350 million more people are closely connected to a child or adult with CP. I don't claim to speak for any of those people. I'm simply speaking for myself. For my son. 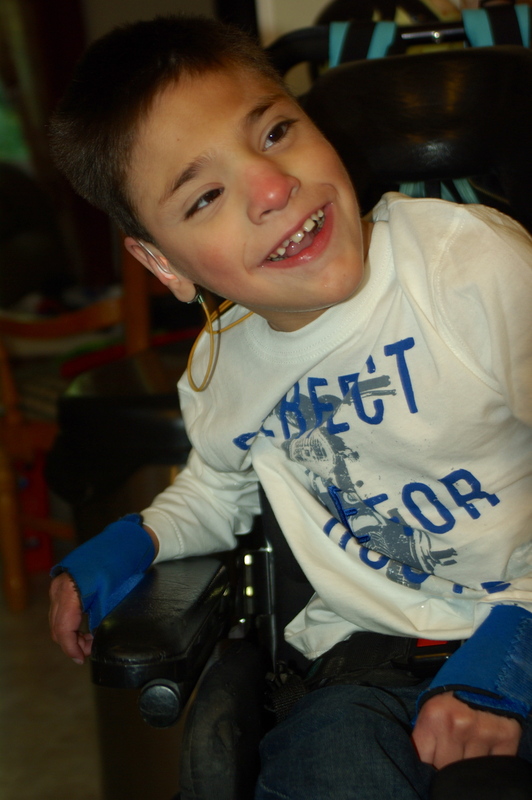 There are many facts about Cerebral Palsy I want the world to know. But the most important one I want everyone to know is how grateful I am I wasn't too scared to check off the box that says CP. For more information about World Cerebral Palsy day and to get involved in making the world a better place for people with CP? Go here. Want to challenge yourself and others to walk, run or roll your way to raising awareness for Cerebral Palsy? Go here. Want to learn more about Cerebral Palsy itself? Go here. Want to see funny pictures of dogs being shamed for their naughtiness? Go here. Not a dog lover? I've got cat pictures too. Happy World Cerebral Palsy Day people.